The manager took us all by surprise with his team selection. 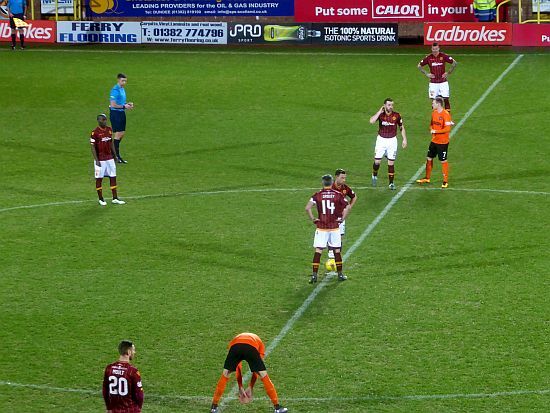 Half of those who lost to Kilmarnock on Saturday were missing as we kicked off in the claret away strip. Laing, Moult, Hall, McFadden and Lasley joined the fray while Hammell, Pearson (suspended), Ainsworth, Law and Kennedy had the option of watching from the stand. The 3-4-1-2 shape had Laing, McManus and Hall in front of Ripley with McFadden lurking behind the striking pair. The first serious goal attempt came half way through the first period when Spittal forced Ripley to a good save at the near post but that apart the crowd had little to cheer. The ball spent a long time in the air and our training session of heady tennis seemed appropriate. The game looked like a contest between the bottom two teams in the league. Defences were on top and both teams were quick to get in place when possession was lost. Something wonderful and unexpected happened on the stroke of half time. McDonald won a free kick wide on the right. It was a typical move from Skippy, he got his body in front of Dillon and the assistant gave the foul. McFadden deposited the ball on the head of McManus and it soared over the crowded six yard box and nestled in the net with Kawashima stranded. Maybe the heady tennis was paying off. United made the early running after the break and they were unlucky when Spittal and Rankin combined but a tangerine shirt blocked the shot. Paatainen made a double substitution and McGhee countered by introducing Law for McFadden. The pressure on our goal continued and we were fortunated when McManus and Ripley collided on the goal line setting the ball loose. The woodwork saved us. Johnson earned a corner after a fine dribble into the box and Law delivered. The ball glanced off a head and landed at the feet of McDonald just beyond the post. He smashed it hard into the net. It was against the run of play but that hardly mattered to the small band of 'Well fans who joined in the celebrations. McDonald and Johnson tested the 'keeper with decent strikes before McDonald scored the third. He collected the ball 30 yards out, ran across the and unleashed a low drive to Kawashima's left hand corner from 25 yards. Game over.